This unique dining option is where you can swing by for an award winning glass of wine to go, a full picnic basket of gourmet sandwiches, or the poshest version of a "lunchable" you've ever laid your eyes on. Open daily from 11 a.m. until 12 a.m. 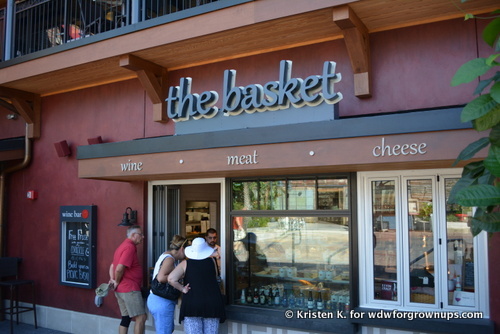 The Basket at Wine Bar George fills a Disney dining need you probably didn't even realize you had. Unless of course, like me, you are a consummate snacker that needs more protein than sugar. The whole of The Basket consists of a simple service window, where you order and pay in the same location. 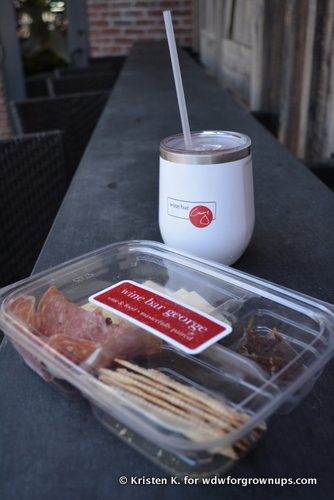 The cuisine is simple but luxurious, and designed for you to grab and go. A small menu boasts gourmet sandwiches, bites & boxes of charcuterie, cookies, and the option to combine a selections of flavors into a lush picnic meal. 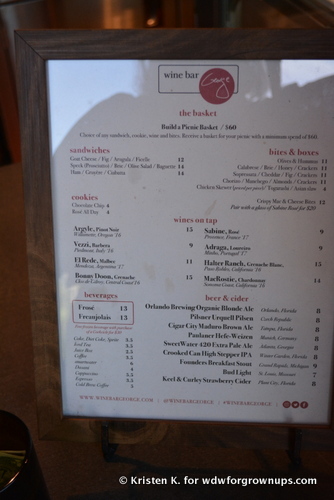 Best of all for the oenophile in your group, the window offers a great selection of wines on tap. As well as several beers and ciders. 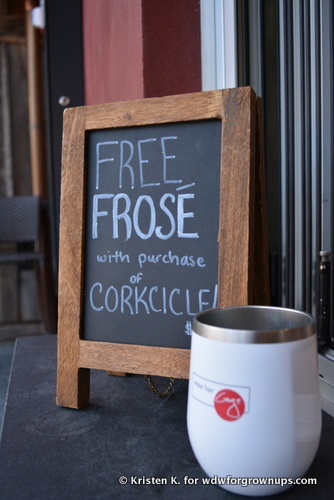 For those warm Florida days guests here will also find two tasty frozen beverages, the Frose' and the Freaujolais. Both of which are worth a stop on their own in my opinion. The day I visited The Basket I picked up a grab and go bite box to eat on the way to the airport later. I also couldn't resist the lure of the Freaujolais in a souvenir corkcicle. I'm not a huge red wine drinker, but the Freaujolais is nothing to be worried about and was almost sangria-like in its flavor. I also want to make a note here that my corkcicle kept that baby icy for three hours. It may have lasted even longer if I hadn't of finished it off before getting on the Magical Express. If you're looking for a spot to sit and enjoy your snack, instead of grabbing it to go; guests will find a few high bar chairs against a rustic slate shelf along the outer wall. 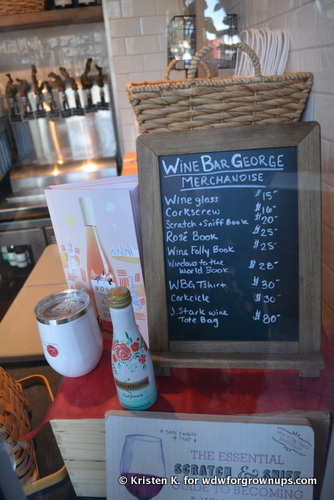 In addition to food and wine at The Basket, guests looking for wine themed souvenirs will also find a fun selection for sale here. 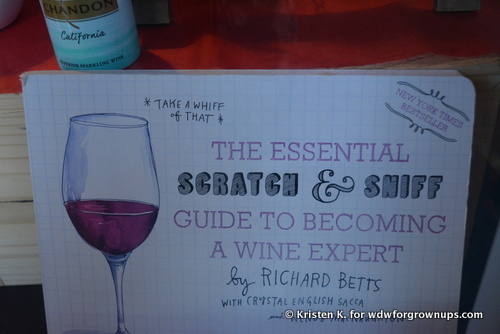 As I mentioned above, I came home with a corkcicle, but 'The Essential Scratch & Sniff Guide To Becoming A Wine Expert' is a book I totally need on my shelf. To be sure I will be budgeting a little more money to spend here on my next trip. The Basket fills two needs that I have during vacation that have been lacking. First I like to have healthy adult snacks on hand in the hotel room when possible. 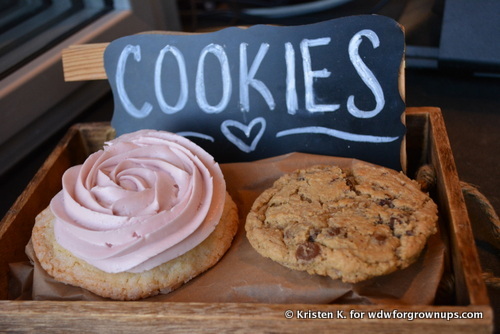 We always end up with left over desserts in our fridge, but the amount of sugar consumed on a Disney vacation can be overwhelming, especially for folks with dietary concerns. 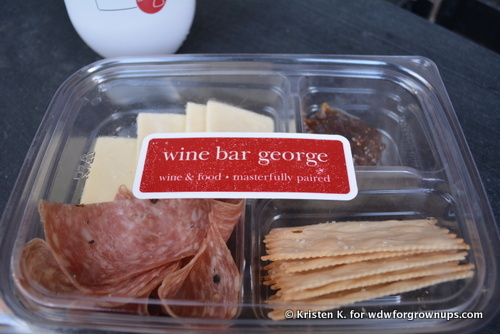 The charming grab and go boxes offer the perfect portion of protein rich snacks. 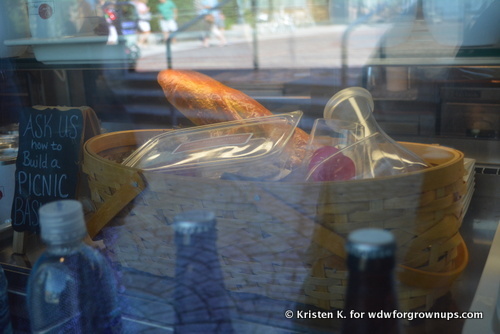 Stopping at The Basket on arrival day means that I know I will have appropriate food in my room when I need it. Second, grabbing a picnic meal from The Basket on departure day lets you and your group hit the road knowing that you've got something packed for the trip that's better than a quick burger in a drive-thru. 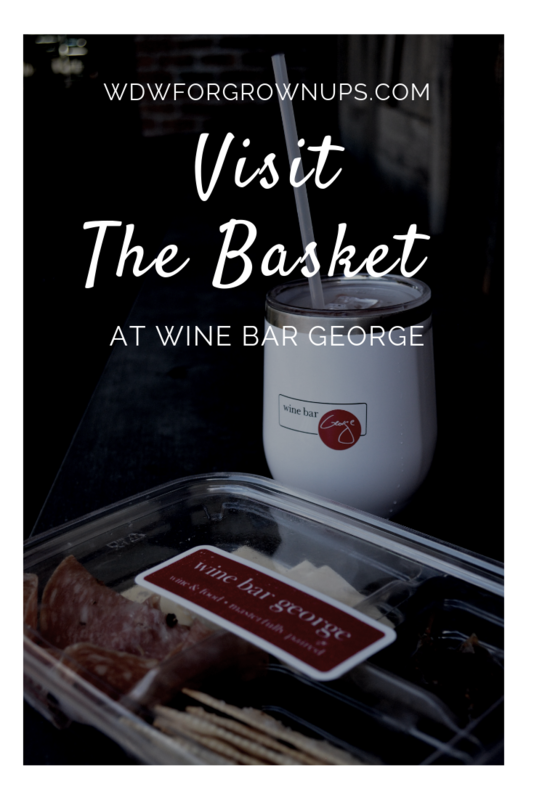 Have you been to The Basket at Wine Bar George? What did you think? Leave a comment and let me know!